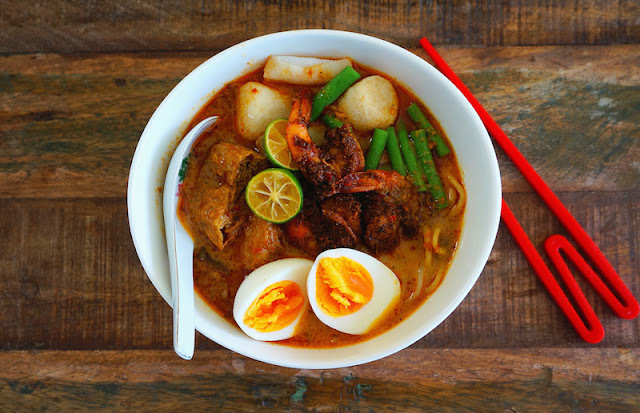 There are many recipes for curry laksa, and I have a few versions in my blog too. Nevertheless, there's no harm for another good one. For the soup base: Grind the fresh ingredients and candlenut until fine paste. Then mix in the dried spice paste until well blended. In a large stockpot over low heat, add the oil and cook the spice paste until fragrant, stirring continuously. Then mix in the curry and Pandan leaf. Continue to stir the paste for another 5 minute and season with some sugar and sea salt. Remove half of the spice paste and set it aside. Toss in the shrimps. Stir and cook until the shrimp are pink and opaque. In a stockpot, add the remainder samba paste. Give it a stir and mix the curry and panda leaf, mix well. Pour in the chicken broth and coconut milk into the spice paste mixture. Bring the mixture to a boil, lower the heat and simmer for about 25 to 30 minutes. Then add the tofu puffs and let it cook for another 2 – 3 minutes. Season the soup with sugar and sea salt. To serve, place some noodles and rice vermicelli into a large bowl. Then top it with some bean sprouts, long beans, eggs, shrimps and fish balls, if using. Then ladle the hot soup with a few tofu puffs onto the bowl and serve with some Kalamansi limes, if desired.